Fresh Hop Beer In Portland! What does Oregon have that much of the rest of the world does not? Fresh hop beers, and tis the season! Locals can rejoice and visitors can revel in their luck of being in the right place at the right time. With more than 75% of American hops grown in Oregon and Washington, not to mention that the hops must be used within 24 hours of picking in order to make these special seasonal beers, Oregon is the place to be for the next couple weeks. Harvest just happened and the beers are starting to roll out. 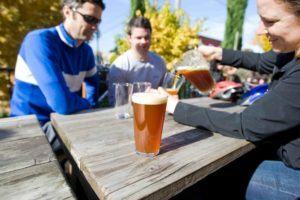 Guests on our Oregon Brewery Trail tour are already getting samples, but if you’re just interested to do hit a couple places on your own, here’s a quick list of some top brewery picks where fresh hop beers are already on tap. some sun on a picnic blanket while enjoying a glass. Pond, Chasing Freshies, Fresh Hop Hop City IIPA. Yum! Hop Ale in this eclectically awesome downtown brewpub. Sept 29 & 30th, at the Portland Fresh Hops Beer Fest at Oaks Amusement Park.